Autocue, Teleprompter hire for Studio Filming. Autocuehire is a bespoke autocue and teleprompter hire company with a great reputation in the industry. Our systems have been used in studios all over, from filming game shows and national adverts to corporate videos and film promos. Whatever your studio job, our kit and very experienced operators can help make your shoot day a success. 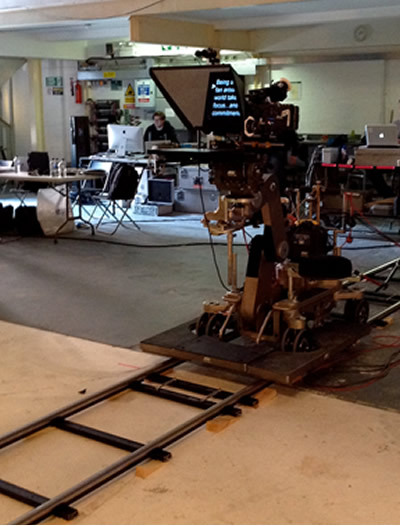 Studio shoots can be very expensive, but the cost of hiring an autocue could easily be made back in shooting time. You can be confident that your presenter will be word perfect, every take. Our autocue systems fit directly onto your camera using robust brackets; our teleprompters can also be mounted independently off camera, on our own tripods (which we provide as standard). This method is useful for interviews or when actors need to speak to each other with a little help. We can mount onto jibs, peds, cranes and tracks. Cue lights and batteries can also be provided depending on your requirements. Our smaller teleprompter units are perfect if you want to go handheld with the camera or use a steadicam, the small monitor can also be mounted directly above the lens of the camera using a magic arm, ideal when weight is a concern. We use Ultra bright monitors, ideal for reading at a distance or in bright studio lighting. They can be mains powered, run on batteries or even take power directly from the camera. Our operator brings everything to the studio, sets it up, makes any script changes needed and the runs it for your presenter. Then takes all the kit off site when the shoot is finished. What are the benefits of an Autocue in a studio? An Autocue can be a real time saver, great if your speaker is on a tight schedule or studio time is limited. Alterations to the script can be made directly with the Autocue operator giving you one less thing to worry about. We are cost effective; the amount it costs to hire an autocue can be made back in studio time saved. Having your presenter read the script rather than try to remember it will make the edit easier as each take will be the same and easily traceable by your editor.